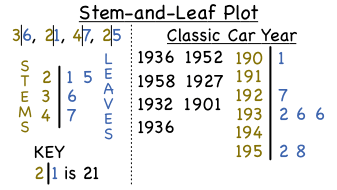 Stem-and-leaf plots can be really helpful in visually interpreting data. This tutorial introduces you to stem-and-leaf plots, shows you how to use this special type of graph, and explains some of the popular uses. Take a look! Did you know numbers have place values? This tutorial introduces you to the term place value and shows you some of the most seen place values. Take a look! How Do You Make a Stem-And-Leaf Plot? Stem-and-leaf plots can be really helpful in visually interpreting data. In this tutorial, you'll see how to create a stem-and-leaf plot from a set of data. Then, see how to interpret the plot!